“best kept secrets.” Personally, I think there are far too many “best kept secrets” on the local arts scene. DCMF Music Director and Violinist Barbara Govatos promised a program worthy of the milestone, and she did not disappoint with set lists that blended the traditional and the contemporary, old favorites and some genuine surprises. Where else would one see two double bassists over two weekends? 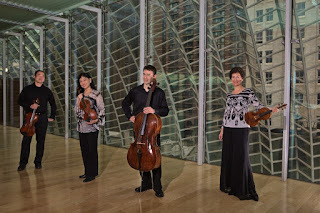 The first concert (Friday, June 12) opened with Rossini’s String Sonata No. 2 in A Major. 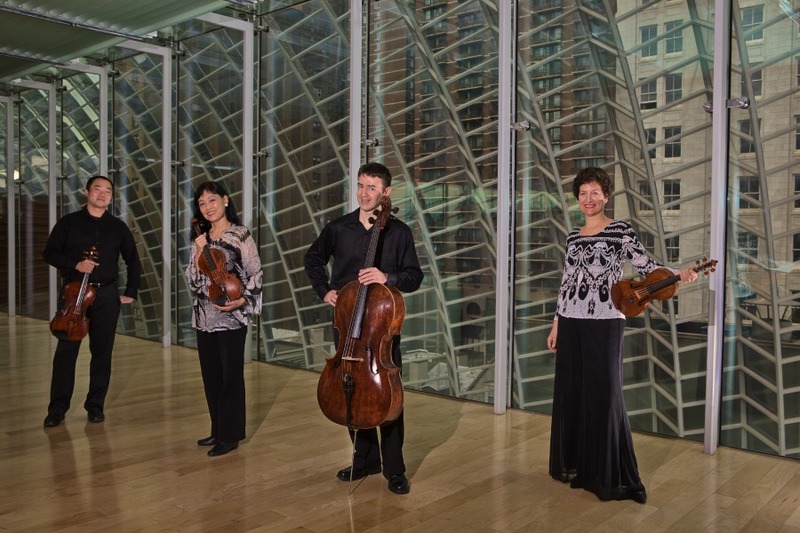 Bright, breezy and charming — he wrote it when he was 12 — it nevertheless requires precision, subtly graded dynamics and purity of tone — all qualities brought by the festival quartet with deft support from debuting guest double bassist Xavier Foley. A nice contrast was achieved with a Piano Trio by cellist-composer Gaspar Cassado. It is explicitly and ethnically Spanish from its very first chords. Pianist Marcantonio Barone, cellist Clancy Newman and Govatos are persuasive advocates of this piece that Govatos “discovered” on YouTube, and their playing is first class. The evening ended with a performance of Schubert’s much loved “Trout” Quintet. The ensemble built through the introduction to the opening Allegro with a strong sense of where the music should go, continuing with lively rhythms and balance: Again, Foley is present but never weights the players down. The second concert (Sunday, June 14) opened on a pensive note with a performance of Heidi Jacob’s Winter Light. Inspired by the Bergman film, “In Winter Light,” this serial work has a mournful somberness about it and a highly expressive — not to mention challenging — string part brilliantly executed by Govatos. Collaborating on piano with Govatos was the composer’s husband, Charles Abramovic. The mood considerably lightened when Abramovic and Russian pianist Alexandre Moutouzkine sat down at the concert grands to perform Brahms’ joyful “St. Anthony Variations.” Abramovic reminded the audience that the work was originally scored for two pianos and played for the first time by the composer and his close friend Clara Schumann. This was a truly superb performance, capturing all the color one would hear in the orchestrated version. I don’t think Brahms and Schumann could have performed it any better. They then switched pianos for a performance of Brubeck’s jazz ballet Points on Jazz, a work that had personal significance for both performance. Moutouzkine recalls playing it with his mother, while Abramovic remembers Brubeck from an LP his parents owned. Like fusion cuisine, fusion music isn’t for everyone, but to quote Duke Ellington, "...there are only two kinds of music: good and bad." And this was definitely good and well-played. The third concert (Friday, June 19) carried the theme “A Little Night Music” and featured the festival debut of double bassist Brent Edmondson, a Newark, Del. native. One would expect to hear Mozart’s iconic Serenade in G Major, Eine Kleine Nachtmusic —always a pleasure — but not before something a bit more contemporary in the form of George Crumb’s Four Nocturnes (Night Music II) for Violin and Piano. This is truly night music: delicate and serene. The violin is heard in the highest register with wide-ranging intervals from time to time. There are long silences and occasional hints of birdsong. Only in the second Notturno does the music become a bit edgy. Govatos and Barone do the honors of exploiting the various timbres of their respective instruments: plucking, rapping on crossbeams, touching the strings on nodal points or simply depressing the keys. Schubert explores the music of the night in his mystical Notturno, a single movement for piano trio in which the strings — Govatos and Newman — matched the gentility of Barone’s piano work. Their pizzicato was delicate throughout — not the standard pluck-away — as the musicians found their way through the muscularity of the dotted rhythms and the sonorous and lyrical slow bits. Many have been fascinated with Boccherini’s La musica notturna delle strade di Madrid with its vivid evocation of bells, beggars, drums and the rosary. Here the quartet with the participation of Edmondson dispatched it with an elegant precision. Barone provided an interlude of pure piano simplicity with his masterful performances of Faure and Chopin nocturnes. The festival concluded on Sunday, June 21, with the core quartet taking on a musically and emotionally challenging set. Czech folk rhythms, national fervor, memories of youth and private anguish — the composer is coming to terms with his deafness — unite in the intimacy of Smetana’s String Quartet No. 1, From My Life. From the opening impassioned viola solo executed here by Burchard Tang to the closing pages of the finale which reduxes the dramatic falling fifth of the opening and introduces a whistling high E which signals the tinnitus that plagued the composer later in life, the quartet drills into Smetana’s anguish, creating the shivers it should. Janacek’s First Quarter (Kreutzer Sonata) draws loosely on themes from Tolstoy’s novella: suspected betrayal, regret and disillusionment. This is music that can turn on a dime from introspection to unbridled exhibition, using small but potent motifs, a dazzling array of rhythms and an equally broad range of coloristic techniques and a chromaticism firmly rooted in the early 20th Century. The playing is positively explosive, concluding a strong season on an equally strong note.